After a 2½-hour debate on Wednesday, the City Council was no closer to reinstating the housing incentives policy that’s responsible for the downtown area’s apartment boom the past six years. Throughout 2018, the policy has been on hold at the behest of Mayor Ron Nirenberg as city officials tweak the program to produce more affordable housing. During the meeting, Council members were told that the program’s nearly one-year hiatus has completely halted new development, and they heard warnings that a delay in the policy’s return could further stunt the momentum downtown had been experiencing. 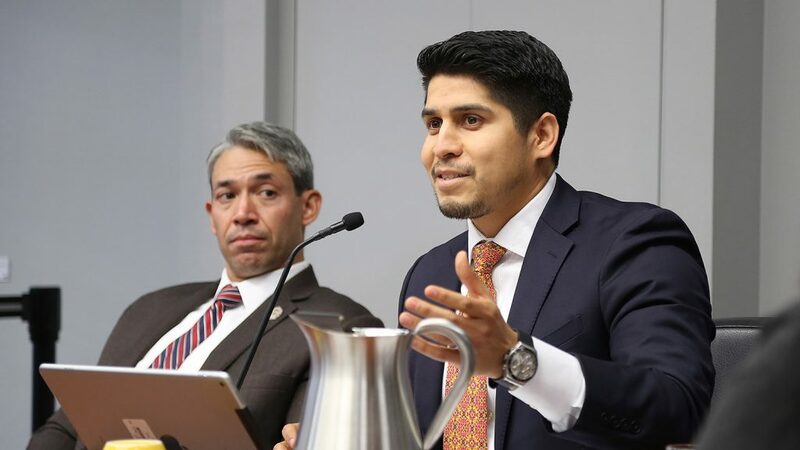 However, Mayor Ron Nirenberg and several Council members held firm and insisted the incentives policy produce a deeper level of affordability for downtown. On the other hand, Nirenberg acknowledged the importance of building market-rate housing to help attract more businesses to the downtown area. Most on the Council agreed the fruits of the program, a “housing first” strategy that took shape under Mayor Julián Castro, are the reasons companies such as USAA, Jefferson Bank, Credit Human and WeWork are moving offices—in the case of Jefferson Bank, headquarters—to downtown. During the meeting, Assistant City Manager Lori Houston said the Center City Housing Incentives Policy (CCHIP) has worked as an economic development generator, and that it was never intended as an affordable housing policy. Affordable housing advocates argue that many downtown workers cannot afford the market-rate apartments CCHIP has mostly helped produce, and that more nuanced rent offerings are needed—not just for service industry workers, but office workers, as well. But the dilemma of striking the right balance between maintaining downtown’s housing growth, while also being mindful of San Antonio’s affordability concerns, confounded Nirenberg and, at times, he admitted he wasn’t able to articulate what that balance might look like. Since its inception in 2012, CCHIP has resulted in nearly 7,000 new residential units—either built or in development—while drawing rebukes from many, most notably Nirenberg, for subsidizing apartments they say many San Antonians can’t afford to live in. Particularly, the policy has produced a flurry of new apartments in the River North area, which includes the Pearl, that hover around $2 a square foot. That translates to about $1,000 a month for a standard studio apartment—a room and a bathroom. In December 2017, while hearing this criticism, and responding to a larger conversation at the time about San Antonio’s economic segregation, Nirenberg placed a moratorium on CCHIP and instructed city staff to revise it. At the meeting Wednesday, several Council members said they needed to be able to sell CCHIP to their constituents. Projects such as the hotel/condo Arts Residences near the Tobin Center for the Performing Arts, where a $10 million CCHIP incentives package will subsidize the project’s luxury condos to the tune of roughly $170,000 per unit, do not sit well with many San Antonians, they said. Nirenberg also said one of the main complaints he’s fielded is the city’s definition of affordable housing. Currently, the city considers housing offered to households making 80 percent of the area median income (AMI) to be affordable—which, for the greater San Antonio area, is $53,440, under federal housing guidelines. Many critics, including District 10 Councilman John Courage, have blasted the notion that 80 percent AMI is affordable, and have asked for CCHIP and other incentives programs to yield more units available to people making 60 percent AMI, which is $40,800 for a family of four. That’s true affordability, they say. When Nirenberg asked her about this, Houston said the reality is that 60 percent AMI in downtown is extremely difficult to achieve. “We do not have enough resources to help subsidize 60 percent AMI,” Houston told Nirenberg. In order to accomplish units at 60 percent AMI, developers would need additional dollars—between $4 million and $13 million—to make enough profit for the development to be worthwhile, Houston said. She said her staff analyzed the pro formas (or, financial documents) of several developments in different parts of downtown to come up with this gap assessment. She used the example of a 283-unit apartment project currently under development on the southwest corner of Broadway and Jones Avenue. Those apartments, known as Broadway Jones, are being built by a partnership that includes developer NRP Group and a city-created nonprofit called the San Antonio Housing Trust Public Facility Corp. (PFC). Half of its units will be rented to people making 80 percent AMI, and the other half at market rate. In exchange, the development group doesn’t pay any property taxes because the land is owned by the PFC. NRP Group told the city it could offer units to households making 60 percent AMI, but it would need an additional $2.5 million to make it happen. Houston said there are only two mechanisms being used that produce 60 percent AMI or lower-cost units: 9 percent low-income housing tax credits (a federal program administered by the state), and the practice of “buying down” rents in PFC projects (a new method that was created just a few months ago). The Museum Reach Lofts, which is being developed by the nonprofit Alamo Community Group, was awarded 9 percent low-income housing tax credits, and is offering units as low as 30 percent AMI. And at the Friedrich Lofts, an East Side project by the PFC and Dallas developer Provident Realty Advisors, 14 of the 374 units will be offered to people making 60 percent AMI. Those units are possible, city officials say, by waiving fees the developer is required to pay, and applying those funds toward rents, thus making them cheaper for the consumer. During his questioning, Nirenberg focussed on the most significant incentive within CCHIP—the tax rebate. Under the old policy, multifamily projects that qualified for CCHIP incentives would receive a 100-percent rebate on city property taxes over a period of 10 or 15 years. They were still required to pay other property taxes such as to the county, the various school and college districts, etc. The revised CCHIP recommends the developer receive a 75-percent rebate on city taxes, and that the remaining 25 percent of taxes paid by the developer feed into a fund that would be used for affordable housing efforts citywide. The Center City Development and Operations Department anticipates such an adjustment will yield $658,798 for the fund via upcoming projects through 2020. Nirenberg asked whether the 75/25 ratio could be adjusted to provide more funding to address the gaps developers say they need in order to make profit. In other words, developers would receive less of a tax break in the interest of pumping up the affordable housing fund so that developers could include more units at 60 percent AMI. Developer David Adelman, one of a handful of private sector experts on hand to answer Council questions, said adjusting that figure would kill some projects that are already on the margin in terms of acceptable profit. Adelman told Council members they were combining the issue of incentivizing the demand for downtown market-rate housing and affordable housing. He contends they are separate issues. He pointed to one of the policy’s goals, which is to produce more density in the downtown core. For the most part, projects that have received CCHIP incentives have been built on the outskirts of downtown—around Pearl and in Southtown, mostly. Houston and Adelman both told the Council that downtown developments are more expensive to build because of high land costs, the rising cost of construction, oddly shaped parcels of land, among other factors—thus the need for more incentives, i.e. tax breaks. This is why achieving affordability in the core is so difficult, they said. However, taxpayers end up saving in the long run, Adelman said. Adding to his point, Adelman, who developed the 1221 Broadway lofts, said after the term of the tax breaks end—either 10 or 15 years, depending on where the project is located—the city reaps the full benefits of those property taxes. District 4 Councilman Rey Saldaña agreed with Adelman about the need for more density, especially as San Antonio’s population is expected to increase by 1 million by 2040. But he also drew a line in the sand and said he has to be able to look taxpayers in the eye and justify handing out tax breaks to projects that are sometimes market rate, but that are also sometimes luxury dwellings. He could do that, he said, if developers were willing to include 60 percent AMI units. If they’re not, he feels San Antonio should not provide incentives. “If that means we can’t build more housing, that’s just the consequence and we’ll see what happens with these 6,800 units we put up online,” Saldaña said. He took it a step further and said that he didn’t believe developments on downtown’s outskirts needed incentives. This is the conclusion of a city-funded assessment of CCHIP, conducted by Austin firm TXP. Houston told Council members that projects in the outlying areas could still require incentives, a situation largely dependent upon location. » Downtown’s housing incentives are changing. Here’s why you should care. » Are developers receiving incentives they don’t need? District 7 Councilwoman Ana Sandoval agreed with Saldaña on his broader points, and said CCHIP wasn’t solely an economic generator anymore. District 6 Councilman Greg Brockhouse agreed that the CCHIP revisions weren’t where they needed to be, but in a completely different direction than his Council colleagues. He described the assertion that people want to live downtown as a “false narrative,” saying that affordable housing was needed throughout the city. But not all Council members thought the policy wasn’t near where it needs to be. District 1 Councilman Robert Treviño and a few other members of Council echoed many of the arguments made by Adelman, and said the CCHIP revisions struck the right balance. 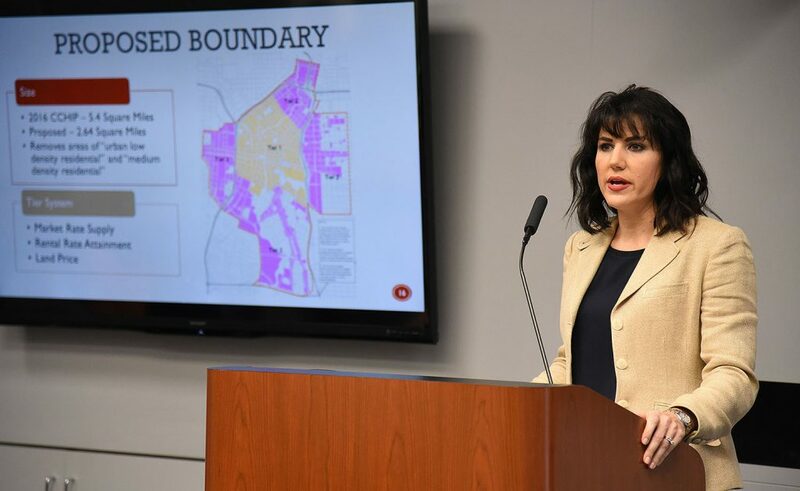 Other Council members, such as Shirley Gonzales and Clayton Perry, felt the CCHIP revisions were ready, and agreed that the program needed to be tested for two more years, rather than the one year Nirenberg had recommended. The Council is expected to vote on the revisions Dec. 6. Amazing how this article and the City Council discussion sheds light on the fact that Developers and SA officials are building tenements, not homes. The city rezones and pushes single family homeowners off their overtaxed land to demolish and build these outrageous “Afforable” housing. Many of these townhomes are marketed for sale only to be rented out. This new market creates renters not earning equity or a real neighborhood experience that once proudly existed in these downtown neighborhoods. SA 300 will be remembered as our History, for now SA future looks like milk cartons or LEGO stacked buildings. It’s less expensive to live north of the city, better schools and yards for pets and kids. Those who work in the tourist industry will have to commute to work now. So when a homeowner pays more for taxes than their mortgage…this plan is not working for the citizen just the Developer. Very good article and ditto to the previous comment. In the end, homeowners in the downtown area & taxpayers pay for the deficit created by the incentives. As usual the so-called experts ignore the plight of low and moderate income people solely concerning themselves with businesses moving downtown. Why would they want more traffic congestion just to build more yuppie housing? Low income tenants must be included in any city subsidized apartment plans. Affordability is directly connected to Income. San Antonio wages are low .The guidelines on AMI aren’t realistic for San Antonio.4 member households in San Antonio generally don’t earn 40 to 50 k so the developers wanting to only participate for people earning the 80 % AMI in order to get the CCHIP Tax breaks isn’t dealing with reality.At least not for local wage earners,perhaps for those extra Million out of Staters that are used to paying thousands for housing.I see this not only as Housing Control but as Family Size Control.Family of 4 means that people are being programed to only have two children because that’s all they’ll be able to afford..Our people have larger families.So these High Priced Housing Costs will force how many children our families can afford. City hall insiders and developers have their hands in city hall’s cookie jar thanks to our city hall representives. Do not be fool, this has nothing to do with real affordable housing for lower or middle income families. It about tax breaks and subsidies so they can make higher profits. No wonder citizen are disgusted with the city manager, the mayor and city council.